A greenway along Merritt's Mill Pond in Marianna. Upper Lake Lafayette trail corridor near Tallahassee. An addition to Shired Island County Park in Dixie County. A proposed corridor for the Florida National Scenic Trail adjacent to Suwannee River State Park. An abandoned rail corridor between High Springs and Newberry. A trailhead in Keystone Heights for the Palatka to Lake Butler State Trail. An extension of the Shingle Creek Trail in Kissimmee. An abandoned rail corridor in Miami known as the Ludlam Trail. Acquisition agreements must be approved by the Board of Trustees of the Internal Improvement Trust Fund at either a regularly scheduled Cabinet meeting or meeting of the Acquisition and Restoration Council, depending on the acquisition price. The fifth edition guidebook for the 1,515-mile Florida Circumnavigational Saltwater Paddling Trail, commonly referred to as the CT, is now available for retail purchase. The 330-page guide, created by OGT, alleviates the need to download and print 26 different segment guides and other information from the OGT website. It includes the trail guide text and data book along with trip planning and safety information and recommended gear for a CT journey. New in this edition is information about alternate routes in the Panhandle and Keys. Color maps must still be downloaded and printed from the OGT website. “The CT helps to boost local economies as well as provide outstanding recreational opportunities for residents and visitors,” said Florida State Parks Director Donald Forgione. “It is the saltwater version of the Florida National Scenic Trail. Retail copies of the $16.95 guidebook can only be purchased on Amazon. Salty tales will be aplenty as paddlers gather at O’Leno State Park near High Springs on April 16 to share their experiences on one of the longest designated water trails in the world. 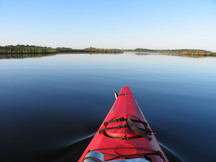 Covering more than 1,500 miles, the Florida Circumnavigational Saltwater Paddling Trail extends around the entire coastline of the Sunshine State, exposing paddlers to a wide variety of habitats and wildlife, including the remote Big Bend Coast, the Everglades and the scenic Florida Keys. Manatees, sharks, stingrays and a host of colorful birds are all encountered. The salty tales and photo shows begin April 16 at 5 p.m. at the park’s historic Recreation Hall. The park is located at 410 SE O’Leno Park Road, High Springs, FL 32643. Exit I-75 at Exit 414. The park is located on US 441, 8 miles south of the interstate. The event is free to the public with park admission of $5 per vehicle, up to eight people. For more information, contact Liz Sparks, 850-245-2079; liz.sparks@dep.state.fl.us. Please complete the survey by April 30, though earlier would be appreciated. The Florida Department of Environmental Protection will be accepting grant applications during April 11-29 for the Recreational Trails Program, which provides competitive matching grant funds to renovate, develop or maintain recreational motorized, nonmotorized and mixed-use trails and trailside facilities. The program provides financial assistance to municipal, county, state or federal government agencies as well as recognized state and federal Indian tribal governments and organizations registered as active Florida nonprofit corporations that have an agreement with a government agency to develop public lands and recreational trails. As part of the U.S. Department of Transportation’s Federal Highway Administration, the Recreational Trails Program contract agreements are for two years and grants are provided on a 50:50, 60:40 or 80:20 (program/grantee) matching basis. The department has $1.5 million available for motorized trail projects this year. At their March 31, 2016, meeting in Tallahassee, the Florida Greenways and Trails Council recommended that the 260-mile St. Johns River-to-Sea Loop Trail System be recognized as the next regional trail system to receive funding from the Shared-Use Nonmotorized Trail (SUN Trail) program. The SUN Trail program is managed by the Florida Department of Transportation and allocates $25 million annually to its work program to construct paved non-motorized trails within the Florida Greenways and Trails Priority System. The Florida Greenways and Trails Priority System (FGTS) was established in 2012 through a public process coordinated by the Florida Office of Greenways and Trails (OGT). This past year, OGT and the council worked closely to develop the criteria to help assess the regional systems within the FGTS. OGT staff presented a detailed analysis of seven regional projects within the priority system that met the SUN Trail criteria. The Council members also heard public testimony and presentations by trail representatives. The St. Johns River-to-Sea Loop includes the entire Palatka-to-St. Augustine State Trail and follows along the East Coast of Florida and the St. Johns River corridor. It includes small towns, several state parks, visitor attractions, ocean views, and rural and wooded landscapes. Trail users can also access the trail through Amtrak and SunRail. On the south end, the loop system co-exists with the Coast to Coast Connector, a 250-mile trail system extending from St. Petersburg to Titusville which was selected as the number one regional priority trail for SUN Trail funding at the December, 2015, council meeting. Segments of other trails within the FGTS will also be eligible for funding as individual trails under the SUN Trail program. FDOT expects to begin programming the regional trail systems, as well as individual trail segments, this summer. The Coast to Coast Connector is a 250-mile connection of local trails that will soon cross Central Florida, connecting the Gulf of Mexico to the Atlantic Ocean. The Connector will span nine Florida counties, countless communities, and each trail has a different manager. OGT has produced the third biennial report about the project and it is viewable online. This report provides a map update to the trail, SUN Trail updates, and provides an overview of the ongoing Urban-Rural Overlay Study being conducted by the Regional Planning Councils in Central Florida. Merritt’s Mill Pond, a dazzling spring-fed water body in Jackson County near Marianna, was recently approved to move forward by the Florida Greenways and Trails Council as Florida’s 56th state-designated paddling trail. Arising at first magnitude Jackson Blue Spring, this jewel offers a four-mile long paradise for paddling, boating, photography, cave-diving, wildlife viewing and fishing. This is an excellent destination for beginning paddlers and families with children as the clear waters provide plenty of underwater magic to keep youngsters enthralled. Paddlers in canoes, kayaks and stand-up paddleboards cruise through the shade of majestic cypress trees that ring the waters, draped with Spanish moss. 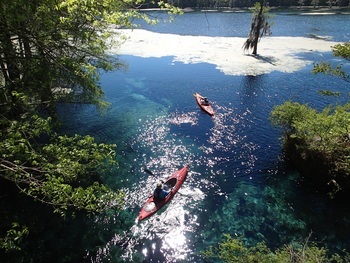 Shangri-La Spring, a tiny azure gem, lures visitors from the nearby Jackson Blue Spring Recreation Area where kayaks and canoes can be rented (open Memorial Day through Labor Day). Other access points along the trail are open year-round. While motor boats are allowed on the pond, the many underwater stumps limit the speed and number. Merritt's Mill Pond is renowned for excellent fishing and trophy Redear Sunfish (shellcracker). The pond currently holds the state record for Redear Sunfish at 4.86 pounds and until recently was the world record for this fish. Cave divers have also deemed the lake’s springs as exceptional destinations for exploring underwater caverns and caves. Make a base camp at nearby Florida Caverns State Park to explore the natural wonders, history, culture and many outstanding recreational opportunities in the area including two other popular designated paddling trails, the Chipola River and the Upper Chipola River. Ochlockonee River State Park recently installed a new kayak/canoe launch adjacent to the boat ramp that is accessible to people of varying abilities. It is a chute with rollers and handrails that makes it easy and fun to launch. And you won’t even get your feet wet! “The new kayak launch is great, especially on a cold day!” said paddler Elizabeth Swiman. “It provides a safe and dry way to get situated in your boat and also adds a moment of whimsy as you ride your own little log-flume into the water.” The launch is designed for easy re-entry from the water, too. 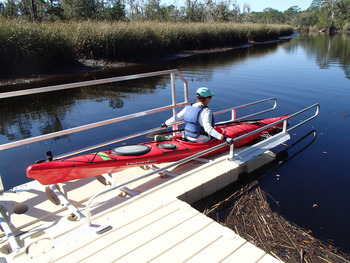 Other state parks, such as Lake Kissimmee, Oscar Scherer, Sebastian Inlet, Jonathan Dickinson and Lignumvitae Key have also installed the accessible launch docks. 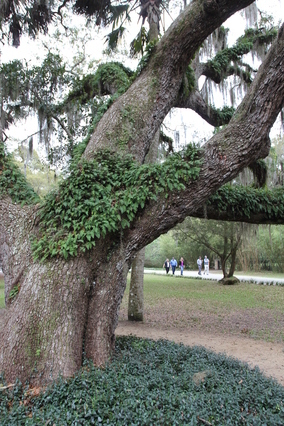 Spring is a perfect time to stroll through Washington Oaks Gardens State Park and other parks..